The Alamonte 1 black finish, 2 light outdoor box lantern is rated IP44 and classically styled with a contemporary twist. Can be fitted to a wall or flush to the ceiling in an outdoor porch. 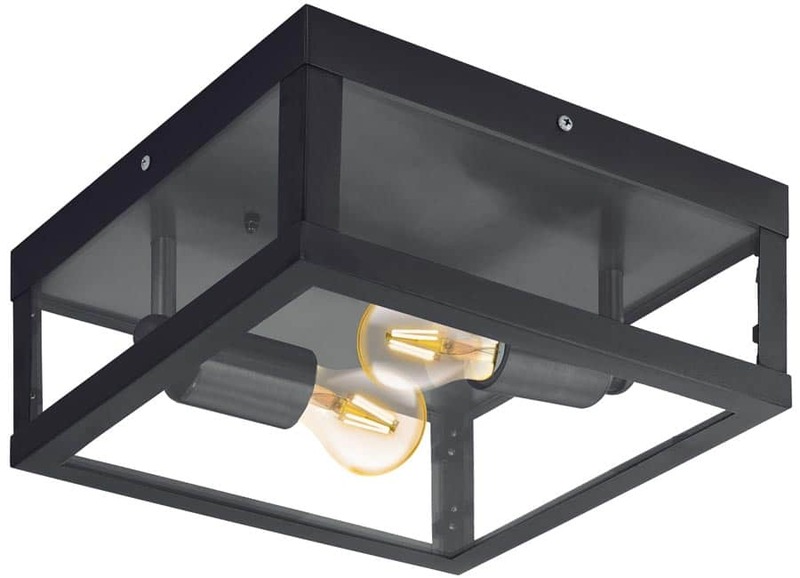 Rectangular flush mount finished in black, with a square profile lantern and clear glass panels containing two light bulbs. Shown here fitted with filament LED lamps that are not supplied but can be purchased separately by following this link. This is a tough outdoor box lantern constructed from black finish hot galvanised steel, with clear glass panels that will give many years service. RE. Alamonte 1 Black 2 Light Outdoor Box Lantern IP44: Can you let me know if this light has side or rear entry cable? Thanks. The cable on this light enters from the back into a terminal block which is situated within the base of the fitting.